Welcome to San Francisco’s first fully interactive comedy variety show. 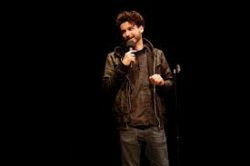 Come to “Crowd Control” for a night of stand up comedy & competition with cocktails for couples, casuals, companions, cousins, co-workers, crews and compadres. Trivia, comedy, physical challenges, roast battle, Gift Card Prizes, musical performances, drink specials and free admission are making Mondays the new Saturday in San Francisco. This weekly event is the place to be and the ultimate experience.